The T-Intersection Concept for the Pennsylvania Ave-Potomac Ave Intersection. Sanjay Kumar of DDOT and Karl Kratzer of CH2MHill, DDOT’s consultants for the project, opened the meeting with a presentation on the project and the project timeline. The goal of the second public meeting was to present potential design concepts and get community feedback. No Build – No changes to the intersection, just adjustments to signal timing. Mid-Block Crosswalk – A mid-block pedestrian crosswalk would be added between the two existing intersections of Penn Ave SE and Potomac Ave. SE. 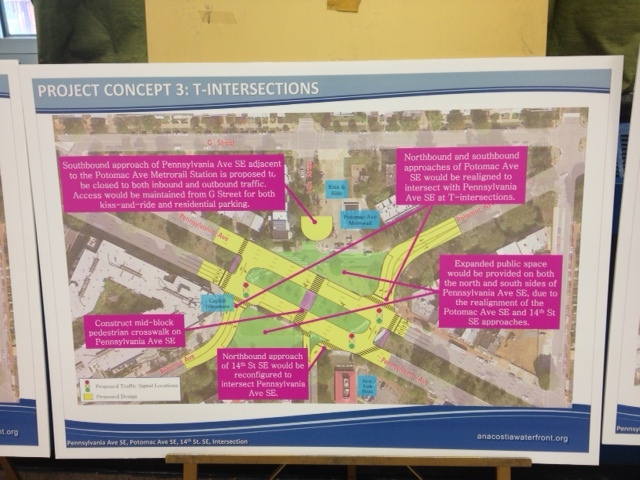 T Intersections – The Potomac Ave entrances to Penn Ave SE would be modified to intersect at T configurations. The new intersections would result in additional public space both north and south of Penn Avenue. A mid-block pedestrian crosswalk would be added between the two re-configured intersections. And the southbound approach of 14th Street SE to Penn Ave adjacent to the Potomac Ave Metro station would be closed to traffic and be converted to a new Kiss and Ride. Signalized Oval – The intersection would be completely reconstructed into a signalized traffic oval with all approaches to the oval signalized. There would a mid-oval crosswalk installed at 14th Street SE and pedestrian crosswalks installed at each end of the oval. DDOT conducted traffic studies of each design concept based on projected traffic flow in 2040. Concepts 1 (no build) and 2 (mid-block crosswalk) would improve existing conditions for vehicular traffic and would slightly improve conditions for pedestrians. Concepts 3 (T-intersections) and 4 (signalized oval) would minimally degrade intersection conditions for vehicles but would significantly improve conditions for pedestrians. 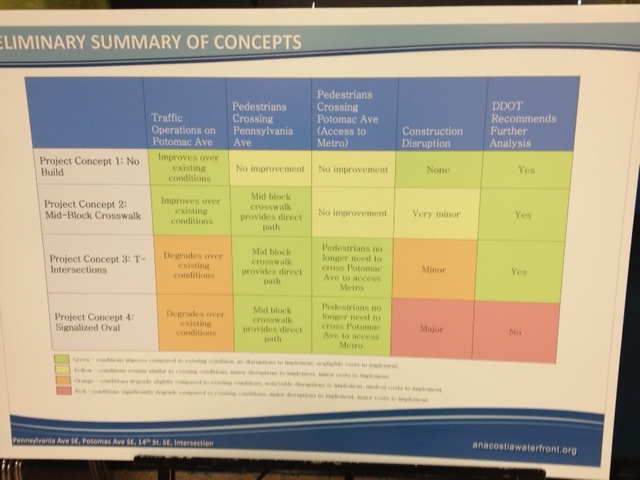 After analyzing the data and considering cost, DDOT has ruled out Concept 4 and will examine concepts 1, 2 and 3 for the remainder of the study. Of the three remaining concepts, my preference is T-intersections, which would do the most to improve pedestrian crossings and safety. I also like the additional public space that would be created around the Potomac Avenue Metro plaza. The other two concepts would really not do near as much to improve pedestrian safety at the intersection. The project’s third public meeting will likely be a public hearing on a draft Environmental Assessment (EA) which will recommend one of the concepts. DDOT anticipates holding this hearing in July. Summary of design concepts for the DDOT Penn-Potomac Ave Pedestrian Safety Study. This entry was posted on Sunday, May 19th, 2013 at 8:30 pm and is filed under Penn East, Potomac Avenue Metro, Transportation. You can follow any responses to this entry through the RSS 2.0 feed. You can leave a response, or trackback from your own site.